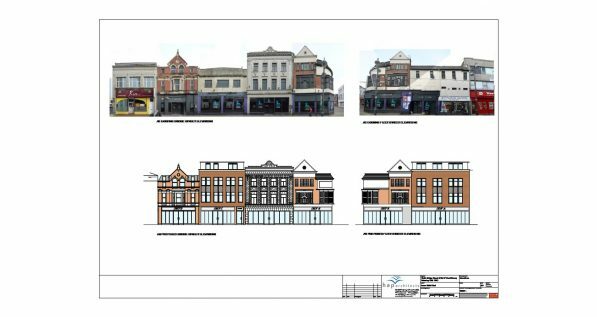 HAP architects are proud to have achieved planning permission for a residential and commercial development in Swindon Town Centre, which is within the pedestrian retail core adjacent to the main shopping parade and close to the heritage quarter. The site is located on the corner of Bridge Street and Fleet Street. Several of the building elevations have an unexpected variety of historic and characterful detailing however they are in a relatively poor state of repair. This area was identified in the Swindon Town Centre Masterplan as a priority location for investment and development. The planning permission was granted for 14no. residential units comprising 1 and 2 bedroom units with private amenity area, as well as 4no. commercial units. The site was previously used as a nightclub. The design was governed by retaining 3no. of the building façade. Hopefully,development will contribute to a much needed regeneration of the area as well as retaining the historic character.